A strong design and minimal, yet functional storage help to define our Amish Lancaster Mission TV Stand with No Drawers. This rectangular television stand that is available in two depths will support your television viewing needs with one adjustable shelf behind each smoked glass door and a 1-inch thick top. The soft-close hinges on the doors will prevent slamming, and ensure the longevity of the piece. Mullion and corbel details give this clean design that mission-feel. 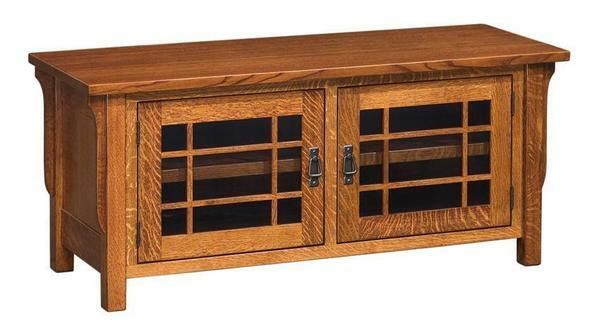 Shown in quarter sawn white oak with Michael's cherry stain and #17 hardware, this piece can be custom-made from a variety of wood, finish, and hardware options.